I thought the person I was with farted real bad while I was having a drink a couple of hours ago, but they are now vindicated. 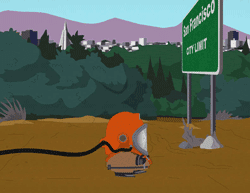 It appears that a Mysterious Mega Smell rolled across San Francisco in the afternoon. Various theories—red tide, sewer cleaning—but none confirmed. Maybe it’s time to declare a smug alert? Andrew S. Ross at SFGate.com posts his experience of the big stink and gets lots of comments generating more . . . uh . . . heat than light. The locations mentioned cover an impressively wide area. Fascinating too is how people at first lay the blame on local sources before realizing it's a city-wide event. Looks like there will be no definitive explanation. We may have to wait for a repeat when it gets hot again later in the year and then hope there is more investigation by the authorities. Though it may be that it's a big cover-up. Shades of NYC all over again? Perhaps a terrorist is giving things a, erm, dry run?